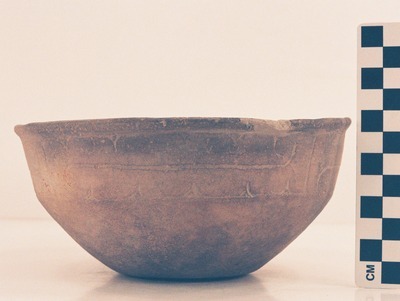 "41MR12, Burial II, 57" by Timothy K. Perttula and Robert Z. Selden Jr.
DECORATION: Engraved on the rim with a horizontal scroll repeated four times around the vessel rim. Each scroll is divided by a single vertical engraved line. Above and below each horizontal scroll are a series of small pendant triangles. Ripley Engraved vessel from Burial II at the Ben McKinney site (MR12-57).